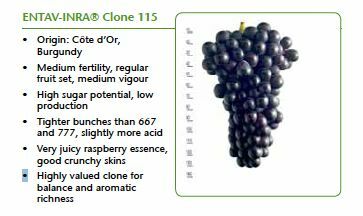 ENTAV-INRA® clone 943 originated in the Côte-d’Or and was introduced in 1989. There is very little published performance information so only generalizations can suffice at this time. It is one of the few Dijon clones that the French have negotiated a royalty payment for every bud sold here in the U.S., so very few nurseries sell the clone. 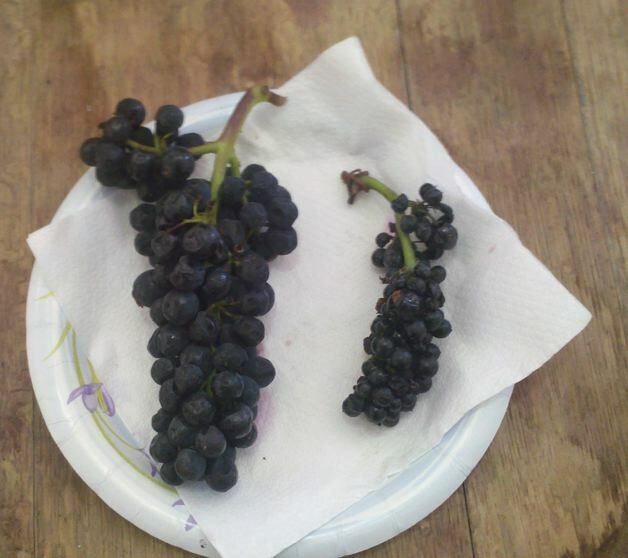 Adam Lee of Siduri gave me this photograph below of a cluster of 943 (right) next to 777 picked on the same day from adjacent sections of Sierra Mar Vineyard in the Santa Lucia Highlands. Note the smaller berries, the chicks and the small bunch size of the clone 943. Adam “loves it” and bottled a single clone 943 Pinot Noir from Sierra Mar Vineyard in 2009. He notes that the wine from 943 is not terribly dark and not particularly tannic. 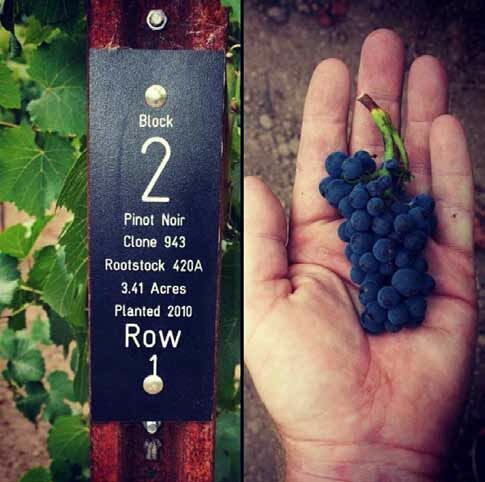 His Sierra Mar vineyard designated Pinot Noir often combines clone 23, 943, 777 and Pommard and he relishes its vibrant dark fruit, richness, depth and mid-palate pliancy. 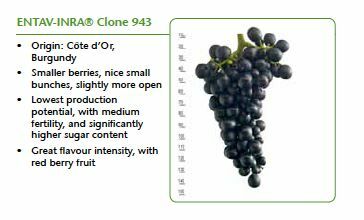 Besides the characteristics noted above, clone 943 has been reported to have medium to low titratable acidity, medium to high polyphenol and anthocyanin production, low yields, medium to low berry size, medium bunch number per shoot and early ripening. The clone has the lowest yield compared with 777, 667, 114 and 115. The wines are aromatic with sometimes atypical aromas. Tannins are sometimes too supple and velvet. According to David Adelsheim, the interest in clone 943 seems to have been the result of a push from ENTAV to position the clone as a producer of top quality wines. However, the Catalogue des Variétés et Clones de Vigne Cultivés en France from 1995 rates the clone with a “B” (not an “A” like 777 and 828). Adelsheim speculates that perhaps ENTAV was impressed by the low crop levels. Adelsheim has 943 planted at Richards Vineyard and Fennwood Vineyard but the vines are still very young (planted in 2008). So far, David and winemaker Dave Paige are not very excited about it. They have found in their vineyards that the clone is a light producer due to the number of chicks and may be challenging to hit sensible economic yields in light set seasons. Paige notes that the wine produced from 943 has “a very plummy, ripe quality we find a little over the top.” He feels the quality might be better with more hens and fewer chicks. That said, the experience at Adelsheim is very limited. In summary, Mike said, “It is a very low yielding clone that may not be commercially viable for some growers. In my experience, yields on the 943 have been 40% to 50% of other Dijon clones and about half the yield of the Calera selection. It is a very high quality clone that because of seedless berries is susceptible to dehydration from heat spikes." Dave Jepson, the winemaker at Treos Wines in the southern Willamette Valley said that the 943 clone planted at Treos had a very expressive nose with flavors of black fruits (black cherries and dark plums) and some earth and truffle notes. The 943 is similar in tone to 667 and 777 but has a bit more of a “savage” edge to it. He wishes he had planted more as he feels it adds complexity to the Treos Pinot Noirs without sacrificing depth and richness of flavor. 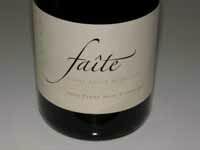 Single clone 943 Pinot Noir has been released by Paraiso Vineyards (reviewed below), Siduri and Melville. Clone 943 is currently planted at numerous sites in Oregon (Adelsheim, Treos, Keller Estate, Beaux Freres, Johan), California (Alder Springs Vineyard, Benvoia, duMOL, Dry Stack Vineyard, Hahn Estate, J Vineyards & Winery, Lone Oak Vineyard, Martin Ray, Melville, Morgan, Righetti Ranch, Sierra Mar Vineyard, Tondre Grapefield, Westwood Estate), and New Zealand (Burn Cottage, Two Paddocks).